It has been said that the day you turn 40, your eyes immediately require the aid of “reading glasses.” We didn’t believe in such things and have been blaming the restaurant’s romantic lighting for not being able to read the menu, the low ppi on the monitor for the fuzzy screen, and having too much coffee for not being able to put the thread through the eye of the needle (we stitch up our own wounds here at RainyDayMagazine). Those excuses worked for a while, but some of the editors had to face the fact that they either had to increase the font size on their screen or get a pair of decent reading glasses and get on with life. Having opted for the latter was a step in the right direction, but it spawned another problem…reading glasses of different prescriptions started multiplying around the office like bunnies. Reading glasses are only good for seeing clearly at one fixed distance. If you want to read, see the computer screen, and do close-up work, three pairs of glasses are (possibly) required. Carrying three pairs around is not convenient, so leaving them all over the place is apparently the standard solution. Actually, there is another solution… TruFocals. Presbyopia: an age-related, progressively diminished ability to focus on near objects, caused by a decline in the ability of the eyes’ lenses to increase their curvature…..and, hence, to focus in closer. Over time, our eye’s lens becomes increasingly less able to change shape. So, as we age, we lose our ability to focus to close distances. This problem is a natural consequence of aging and will happen to everybody. Most people first notice this in their 40’s… when they can no longer read print comfortably. By about age 65, we have lost most (but not quite all) of flexibility in our eyes. TruFocals were invented to address this problem. Each “lens” is actually a set of two lenses, one flexible and one firm. The flexible lens (nearest the eye) has a transparent, distensible membrane attached to a clear rigid surface. The pocket between them holds a small quantity of crystal-clear fluid. As the slider on the bridge is moved, it pushes the fluid and alters the shape of the flexible lens. Changing the shape changes the correction. This mimics the way the lenses in our eyes used to perform when we were younger. This allows the wearer to choose the exact correction that works best at any give distance and under any lighting conditions. The result: clear, undistorted vision over a wide field of view: no zones, no lines, and more importantly, no need for spectacles in every room for every task. TruFocals’ front lenses corrects for the wearer’s far vision and protects the flexible inner membrane. The front lenses are magnetically attached and easily removable for cleaning. Note the ridges on the edge of the lens. They make the lens easier to grip. There are six magnets embedded in a ring at the rim of each lens. 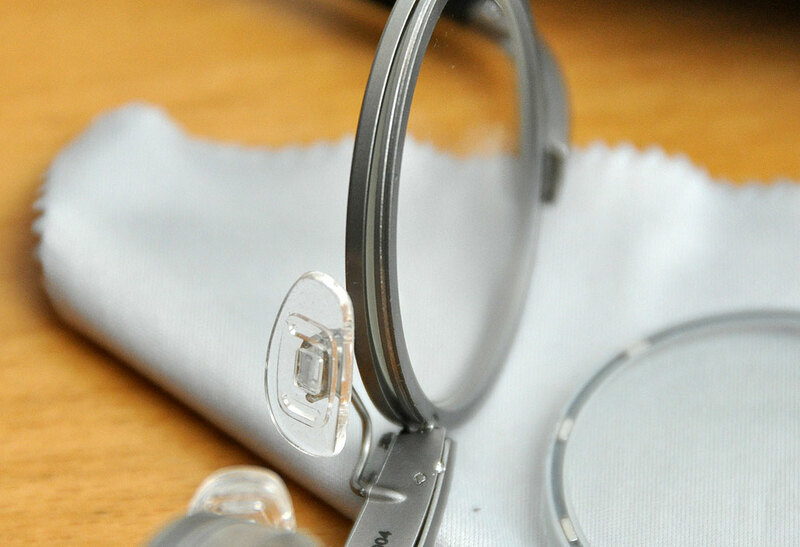 Each lens has a tab so they will properly align with the frame. The easy way to differentiate the left lens from the right is to just orient the tab toward the bridge and let the magnets “click” the lens into place. The tab will automatically make sure the lens is properly oriented (especially important for those of us with astigmatic prescriptions). The flexible membrane is sandwiched between two metal rings. Even so, the rear assembly is pretty thin. 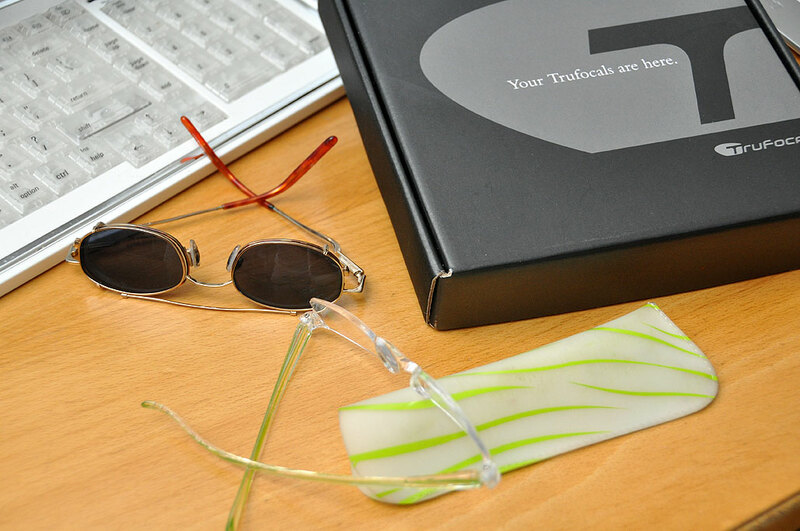 The overall thickness of the TruFocals is really dependent on the wearer’s prescription. We have a -9 correction so our front lens is rather thick, but not any thicker than our regular prescription glasses, and thinner if you include the sunglasses overlay. To adjust the correction, all the wear has to do is move the little tab in either direction. This can be done while the glasses are being worn. The slider is a little stiff right now probably because it is new, but we expect that will ease with use. The advantage of the TruFocals over any of the other multi-focus options (bifocals, trifocals, progressives) obviously is that the entire field of view is in focus. There is no need to tilt your head up and peer down through the glasses to see things clearly. 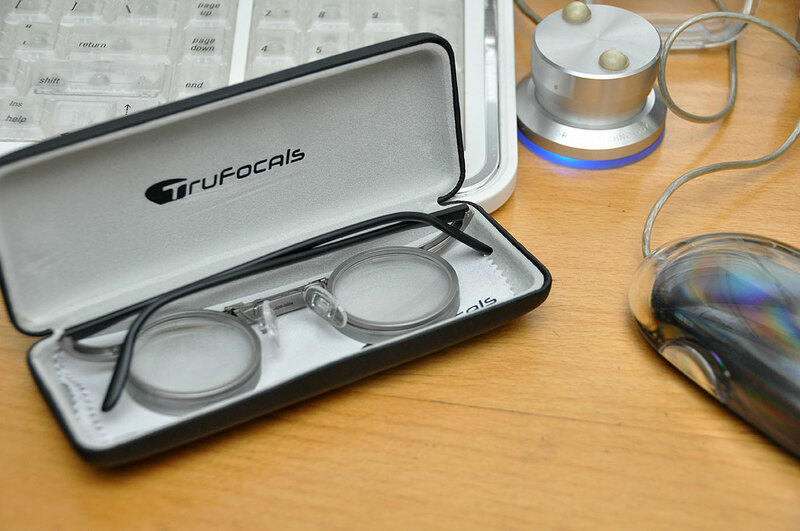 We will be giving up our contact lenses for a few hours each day and wearing these TruFocals. Look for the FirstUse report in a few weeks. We should have the InTheWild review posted before the Holidays (should anyone wish to put these on their gift list…hint, hint).